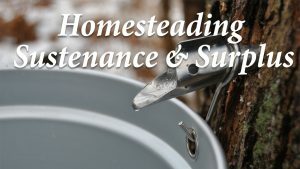 Talk – Can Homesteading Provide Sustenance and Surplus in an Age of Scarcity? Human population growth is on a collision course with biophysical limits of Planet Earth and economic limits of modern industrial-financial capitalism, but current political institutions seem incapable of identifying and responding to these existential crises. This has motivated some people to plan for a future of resource scarcity, climate catastrophe, and economic collapse by investing in homesteading to provide sustenance, generate surplus, and increase resiliency. I built energy-flow models with data from a rural Maine homestead to quantify natural, human labor, and economic inputs and estimate Energy Return on Investment (EROI) as a metric of profitability for producing fuel, food, and value-added commodities. Harvesting firewood with chainsaw, sled, and splitting maul generates a reasonably high EROI and easily meets home heating needs, but bartering or selling firewood is not profitable. Ice fishing with hand auger and sled generates extremely low EROI, but could meet dietary protein requirements if sufficient fossil-fuel subsidies are available. Artisanal maple syrup yields low EROI, but easily meets home consumption needs and could be an important value-added commodity for bartering or selling, especially when subsidized by high EROI firewood harvested on-site. For all three activities, direct and indirect fossil energy underwrites most energy embodied in human labor and economic inputs; thus whether or not this type of homesteading might be “sustainable” in an energy-scarce and economically-impoverished future remains to be seen, but is probably a wise investment among competing alternatives.